As parents, it’s our job to set our kids up for success. Teaching them the most important financial lessons is one the best gifts you can give them – and for free. Here are seven lessons you can teach your kids to help them avoid debt. Save part of all you earn. Saving for retirement is key. But, even before that, it’s important to have rainy day savings that can be accessed in case of an emergency. The perfect rainy day savings can cover a multitude of expenses including a major car repair, medical bills, and even living expenses following a job loss. Teach your kids to save money for big purchase so they’ll know the alternative to buying on credit. Show them how much it actually costs to put $500 on a credit card with 20% interest without paying the balance in full. Always pay your bills on time. Not only will timely bill paying help your kids avoid debt, it also helps their credit score when those bills are listed on your credit report. Falling behind on any bills runs the risk of getting into debt because it’s not as easy to catch up as your kids might think. Let your kids borrow money from you and create a repayment schedule so they’ll understand how loans and loan repayment works. Always know the balance on your accounts. Know how much money is in your checking and savings accounts and you will be less prone to overspend. Be aware of your credit card balances so you won’t spend more than you can afford to pay back. 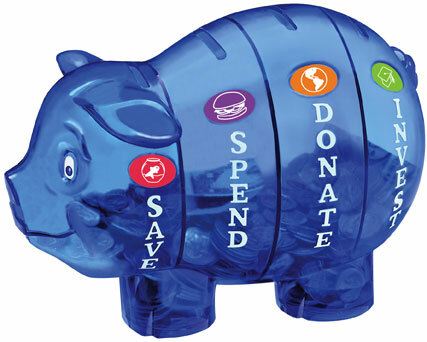 If your child has a savings account, show them how to check their balance online or by phone. Never borrow more than you can afford to repay. For many people, breaking this rule is the beginning of years of debt payments and thousands of dollars paid in interest, money that could have been spent on anything, including fun! Teach your kids to only take on as much debt as they can handle even when the banks offer them much more, which they usually will! Pay back your debts as quickly as possible. Minimum payments are easy and let you keep more of your income, but minimum payments also keep you in debt longer. Paying back debt faster may mean making some short-term sacrifices, but the debt will be paid sooner and with much less interest paid, leaving more for the things that matter the most. Take care of your needs first and your wants second. Food, shelter, transportation, and clothing are a few of the most immediate needs. However, it’s important that you don’t justify spending more money by satisfying your needs with more than what’s necessary. For example, you don’t have to eat filet mignon for dinner. Keeping your living costs low lets you meet other major financial goals like building an emergency fund, saving for retirement, and paying off debt. Loaning money can ruin your finances and your relationship. Loaning money is risky. What if you need the money by a certain date, say to pay your own bills, and the person doesn’t pay you back? Then you’ll have to figure out another way to pay your expenses. Co-signing a loan is just as risky as loaning the money yourself because if the other borrower doesn’t pay, it’s you on the hook for the payments. Start teaching these financial lessons early. Repeat the lessons throughout their lives, making sure to keep it on their level. Most of all, make sure you’re living these financial lessons yourself. This guest post was written by Eliza Collins, who is a personal finance writer specializing in saving strategies, alternative income and debt relief options. You can read more of her articles at the debt settlement blog. These are all great lessons to teach your kids about money and finances. I also think it is important to show them that you follow the same principles yourself. Your lesson will pack much more punch if you are doing what you teach rather than telling them to "do as I say, not as I do". It is also important to actually share your financials (within reason) with your kids so they can see real world examples of personal finance before they head out on their own.